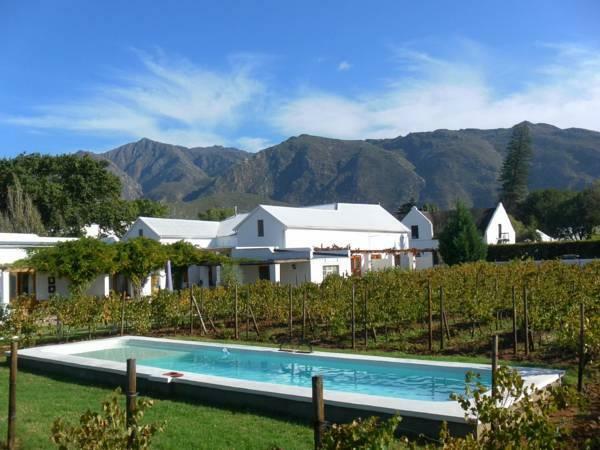 ﻿ The Vineyard Country House Montagu. JIMAT di Agoda.com! Ada soalan mengenai The Vineyard Country House? Dengan lokasi mudah di Montagu, The Vineyard Country House adalah tempat yang hebat untuk menjelajahi bandar yang menarik ini. Dari sini, tetamu boleh menikmati semua kemudahan yang bandar ini tawarkan. Untuk pilihan bersiar-siar dan tempat daya tarikan tempatan, pelancong tidak perlu pergi jauh dari hotel kerana semuanya berdekatan dengan Art Africa, Rumah Joubert, St Mildred's Chapelry. The Vineyard Country House menawarkan perkhidmatan yang sempurna dan semua kemudahan penting untuk menceriakan pelancong. Semasa menginap di penginapan yang indah ini, tetamu boleh menikmati fasiliti tetamu kurang upaya, Wi-Fi di tempat awam, tempat letak kereta, pengangkutan lapangan terbang, bilik keluarga. Semua penginapan bagi tetamu menawarkan kemudahan yang difikirkan dengan teliti bagi memastikan rasa selesa yang sukar ditandingi. Di samping itu, pihak hotel menawarkan aktiviti rekreasi untuk memastikan anda mempunyai perkara untuk dilakukan sepanjang penginapan anda. The Vineyard Country House merupakan tempat yang ideal bagi penginapan pelancong yang mencari keindahan, keselesaan dan kemudahan di Montagu. Particularly the breakfast was outstanding! And very welcoming and friendly staff! Very clean, very friendly and helpful. Excellent staff and breakfast. Stayed 1 night and wished we could have stayed more. The rooms are beautiful each with private patios. The pool is sublime and a saviour in the heat. It’s a treat to swim in between the vineyards with the mountain backdrop. Situated on the main road with walking access to all restaurants. The beds are so comfortable! The breakfast is fine dining! Such a spoil to be treated with so much love and passion. A suggestion for a fridge in the rooms, but it’s not a major as there is a shared fridge and honestly bar in the common room. Excellent place and will certainly be back. Fantastic breakfast, lovely room and welcoming hosts. Great setting in town but surrounded by its own vineyard of juicy muscatel grapes! Beautiful clean room with great outside patio seating area. Breakfast served outside with fantastic homemade offerings of fresh made breads, squeezed juices, fruits and preserves, all truly memorable. Our arrival was met by a warm and gracious Lily. A credit to them. Our room was excellent. Spotless but due to unseasonably chilly weather, a tad cool. However, the added bonus of electric blankets were greatly appreciated. The food was amazing. Taste and presentation. We had four course dinner and fabulous breakfast. Undoubtably the best food we've experienced on our trip. 100% recommendation. Thanks so much for a fab stay. Wonderful stay : beautiful confortable room/bed in the middle of the vineyards, exquisite breakfast, nice little pool. Perfect peaceful place, beautiful mainhouse decorated with taste. Helpfull and nice hosts. Room 2 is separate from the others and has an outdoor shower ! Each room have a little terrasse. Very quiet and good atmosphere. We had a very pleasant one night stay. the only quirky thing is that the shower was on the back patio. There was a shower curtain for privacy,but could have been a bit more private. There was a lovely large bathtub in the ensuite bathroom.Staff was fantastic. Breakfast was incredible! 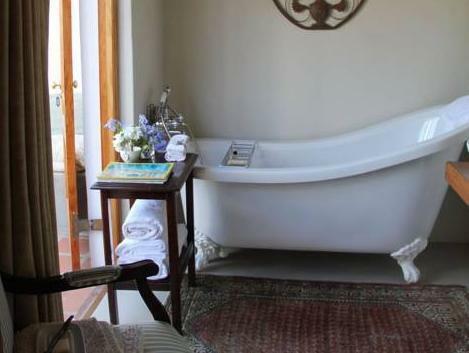 The Vineyard Country House is full of charm and very well run by two women who go out of their way to make their guests feel comfortable at home. The room are artistically done, some attention to details. The mountain view is just amazing, especially when sitting in the lounge area by the pool. Louise and Lauren makes 'the' best breakfast ever!! it came with with freshly baked bread and muffins.We love staying at this place and definitely will come back again. So nice, relaxing and buitiful. We sure wish we could stay at the vineyard country house for a whole month! Herausragendes, abwechslungsreiches und einfallsreiches Frühstück - immer frisch zubereitet und von sehr guter Qualität! Knuffiges Ambiente im Frühstücksraum! Äußerst zugewandte und zuvorkommende Gastgeberinnen. Sichere Lage. Kurze Wege zu Restaurants. Montagu bietet einige schöne Wanderwege in einem Naturreservat (fußläufig vom VCH erreichbar). Wir waren total begeistert. Das Zimmer war so liebevoll eingerichtet, klasse. Die Dusche im Freien genial. DAs Frühstück auf der Terrasse unseres Zimmers unvergesslich. Das Frühstück war einfach grandios, sehr schön eingedeckt und mit viel Liebe zubereitet. Das ganze Haus ist sehr geschmackvoll. Die Gastfamilie sehr nett. Um die Ecke war ein tolles Restaurant. Leider waren wir nur eine Nacht dort. Die Betreiberin kocht wohl super, leider kamen wir nicht in den Genuss, aber mit Sicherheit das nächste mal. Wir waren sehr zufrieden, Preis Leistung super.